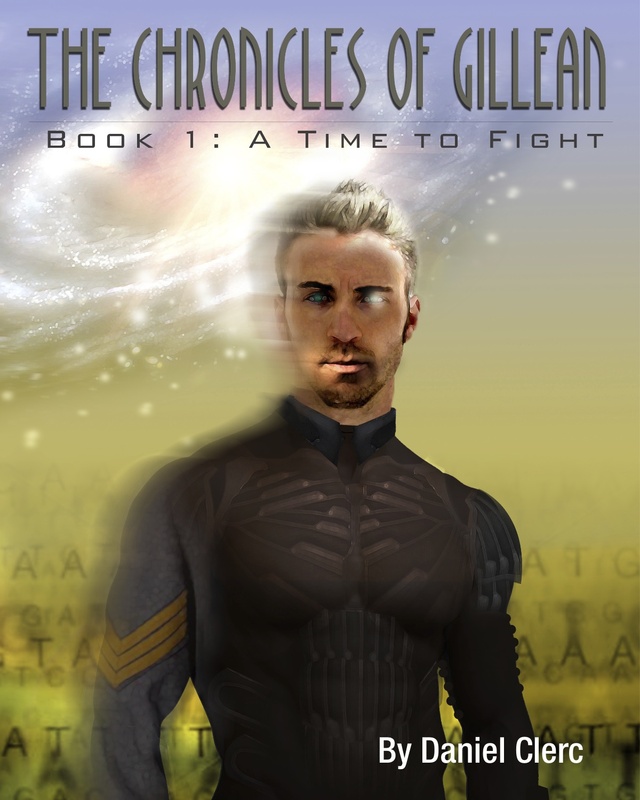 Site dedicated to an exploration of the science, history, sociopolitical ideologies, and psychological drama of the book…"The Chronicles of Gillean"
This is the book cover designed by Chris Bivins. It pulls several of the central themes from the story. In the upper left and the shadow/phase shift added to the image represent the fourth dimension – time travel. The scrolling letters across the back represent the four subunits to DNA. The glow of the left eye represents the imbedded/implanted quantum computer that allows the elite special ops soldiers to integrate advanced weapons systems with the function of their military exo-suits. His torso and left arm represent the exo-suit of the 24th Century. His right arm represents the uniform of the Confederate cavalry during the Civil War (1861-1865).